What did the children of Israel see? Did they see the literally right hand of the Lord? The answer is no. They saw the waters rushing over their enemies. They called this manifestation of God’s power His Right Hand. So it’s clear in this case that there’s nothing literal about the “right hand of God”. Another example is found in the New Testament. As Stephen is being stoned to death, he said: Behold, I see the heavens opened, and the Son of man standing on the right hand of God” (Acts 7:56). Stephen saw Jesus in the place of power and glory, no longer a man but changed and glorified. Stephen saw the “right hand of God” working as it did back in the exodus of Israel. If we read further in Acts 7:59 we see that when Stephen died he called upon God. It’s clear from this scripture that Stephen say only one person. He saw Jesus in the place of power and glory. He didn’t see Jesus sitting on the right hand of God. But..what about the statements “Father and Lord”? Throughout the New Testament we find numerous scriptural phrases in which the words “God our Father, and the Lord Jesus Christ” are found. Some of the scriptures that use this phrase include Romans 1:7, I Corinthians 1:2, Galatians 1:3, Ephesians 1:3 and 6:23. At first glance, these verses seem refer to two distinct persons. This is especially true to those who hold to a Trinitarian view of the Godhead. And please keep in mind that the translators of the King James Version Bible were of a Trinitarian disposition and would naturally select words and or phrases to support their view of the Godhead. One point to remember is that there are no punctuation marks in the Greek manuscripts of the New Testament. All of the punctuation marks were added during the translation process. And hopefully according to what the original writer intended. One good example is found in I Corinthians 1:3. But…didn’t Jesus Pray to the Father? Didn’t Jesus pray to the Father for the loaves and fishes to feed the multitude, for His disciples in the garden of Gethsemane and while nailed on the cross of Calvary? Well, of course, the answer is yes. But are we seeing the second person of the Godhead praying to the first person of the Godhead? 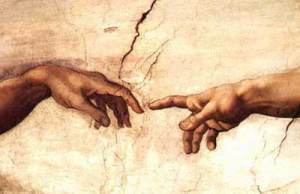 Is “God the Son” praying to “God the Father”? Some would say yes. But if the second person (the son) were co-equal with God He certainly wouldn’t need any help. Only men need to pray for help. So would you agree that one divine person praying to another divine person is an absurdity? What we have is the humanity (flesh) of Christ praying to His divinity (Spirit). The “Son” is the flesh or the body. The “Father” is the eternal Spirit that indwelt the “son” or flesh. It was an Omnipresent (everywhere present) God who was responsible for the voice identifying His flesh (the Son). In the Old Testament, Moses asked God what His name was standing before the burning bush (Exodus 3:13). God told Moses that His name was “I am that I am”. Here in Exodus we see God veiling or hiding His name until it would be revealed at the proper time. Jesus used identical words and told the Jews in John 8:59 “Before Abraham was I am.” What Jesus was telling these Jews was that He was the “I am” Moses talked to. Jesus said in John 17:6 – “I have manifested thy name unto the men which thou gavest me.” What name did Jesus manifest? Was it “Father”? NO Because Father isn’t a name it’s a title. Jesus said “I am come in my Father’s name” (John 5:43). The name of the Father is Jesus. And it’s clear the name of the son is Jesus. When we say Jesus we are using a name which is applicable to the Father, Son and Holy Ghost. This is why water baptism is correctly administered only in the name of Jesus Christ. God reveled Himself more and more through His name with the fullest revelation being Jesus Christ. An angel of the Lord announced to Joseph that a son was to be born to Mary his espoused wife. The angel told Joseph to call the child “Jesus: for he shall save his people from their sins.” (Matthew 1:21). What does the name “Jesus” mean? It comes from word “Jehoshua” which means “Jehovah is become salvation” or “Jehovah has become our Saviour.” Jesus Christ is the express image of God. On Mount of Transfiguration (Matthew 17) Peter, James, and John saw a cloud and heard a voice saying “This is my beloved Son, in whom I am well please.” (Matthew 17:6) After the cloud was gone the Bible says “They saw Jesus only.” (Matthew 17:8) Jesus is the only visible person of God! To say the name Jesus is to speak of the everlasting Father, the Son and the Holy Ghost. The Bible declares that the fullness of the Godhead was all in Him. Jesus has all power in heaven and in earth. Jesus said that “I am Alpha and Omega, the beginning and the ending, saith the Lord, which is and which was, and which is to come, the Almighty” (Revelation 1:8). Is Jesus in the Godhead or is the Godhead in Jesus? Is Jesus the second “person” of a triune Godhead? The word of God tells us that understanding the Godhead is without excuse. In Him, that is Jesus, dwelleth all of the fullness of the Godhead bodily. What the scriptures reveal is that the Godhead is in Jesus!